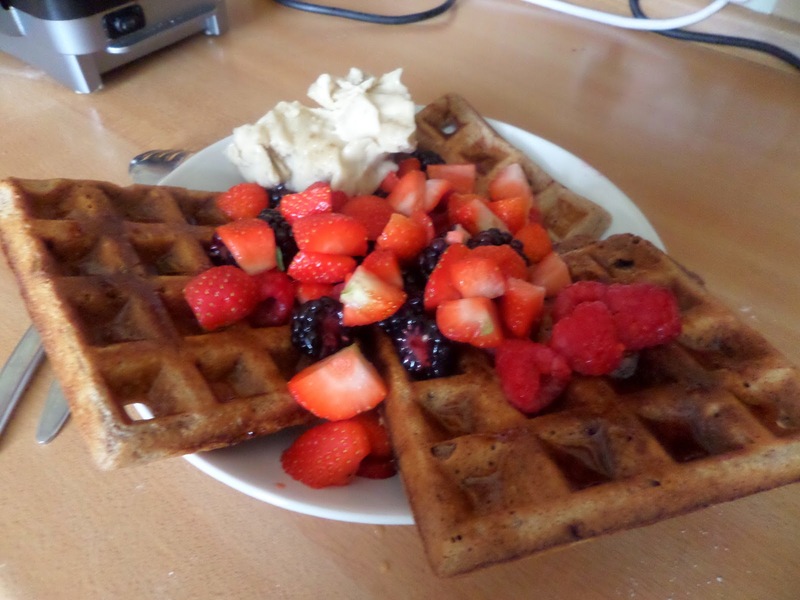 We’ve started having cinnamon waffles & berries for breakfast most weekends now. The old recipe with 5 mins cooking time has been serving us well, as has adding a couple of apples that have been stewed the day before (without sugar) just before cooking. In the past we used to get 4 waffles from the mix… but it used to overflow the waffle maker and cause a horrible mess, and left us with some unused batter. So what we do now is make 6 waffles, and keep them warm in a low oven, which has the added benefit of us eating together rather than one of us running off with the first batch. However they’re not perfect. The outside isn’t as crispy as I’d like, and sometimes the middle can be a bit dense, even soggy. One obvious change is to up the cooking time, so we’ll be trying 6 minutes. Some research on the internet suggests that some cornflour/starch can help crisp up waffles by making it easier for the steam to escape, so I’m going to try adding a Tbsp. While researching for crispiness I also came across a way to make the middles lighter, and that’s by folding in whipped egg white in before cooking. So I’m going to add the egg yolk in the overnight batter, put its white in the fridge overnight, then whip it to stiff peaks with an electric hand whisk before folding it into the batter just before cooking. As is usual we’ll serve with various berries, banana (fake) ice cream, and maple syrup. Success! They were notably crisper, and the insides lighter. However I think there’s room for more crispness, so next time I’m going to try 2 Tbsp of cornflour/starch.